Iowa turkeys from a past state pardoning ceremony. Iowa is sending some turkeys to Washington, D.C. That’s not a commentary on the recent elections — it’s a big honor for the state’s turkey industry. Iowa Turkey Federation spokesperson, Hailey Grant, says a northwest Iowa farm will supply the turkeys for the annual ceremony where the president pardons the big birds before Thanksgiving. “We’re pretty excited. 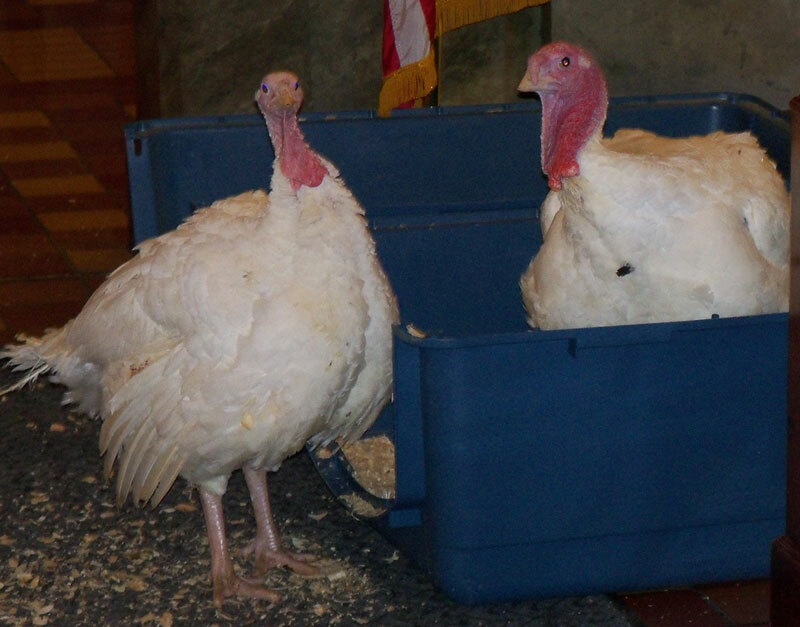 I think it’s a great honor for Iowa to get to raise these turkeys for the president,” Grant says. She says the name of the farm and its owner are being kept secret until later this week for security reasons to keep animal rights groups and others from going to the farm. While a national election chooses the politicians who’re sent to White House, the selection of the presidential turkeys are picked by one person. The process is a little more complicated for the turkey producers than picking out a couple of birds and sending them out east. “What they usually do is they pull 20 or so from their normal size flocks and they have a special building built on the farm where those turkeys are raise — just the 20 of them — with people or noise, so they get acclimated with crowds,” Grant explains. The turkeys that pass the test end up getting pardoned. She says they have a radio playing all the time to generate noise and they end up picking two birds out of the 20 that seem to handle being around people without being skittish are sent to be pardoned. Grant says the honor is a big boost for the turkey industry after being hit so hard last year by the bird flu. She says Iowa’s industry has rebounded and is back to 100 percent production. Most of the turkeys raised in Iowa do not end up on the Thanksgiving table, they are instead used for meat for sandwiches in fast-food restaurants.